In a recent study, a majority of doctors said they overtreat patients because they fear medical malpractice lawsuits. Not only is this fear exaggerated but also doctors seem to use it as a good excuse to perform unnecessary procedures that are very profitable to them. 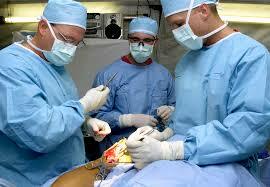 For example angioplasty procedures to implant heart stents in patients are among the most overused interventions. Many procedures not only put patients at risk unnecessarily but inflate the nation’s medical bill. In the study “Overtreatment in the United States” published in PLOS One yesterday, Heather Lyu from the Department of Surgery, Brigham and Women’s Hospital, Harvard Medical School, Boston, Massachusetts, United States of America, Tim Xu, Daniel Brotman, Brandan Mayer-Blackwell, Michol Cooper, Michael Daniel and Elizabeth C. Wick from the Department of Surgery and the Department of Medicine, Johns Hopkins University School of Medicine, Baltimore, Maryland, United States of America, Vikas Saini and Shannon Brownlee from The Lown Institute, Boston, Massachusetts, United States of America and Martin A. Makary from the Department of Surgery and the Department of Medicine, Johns Hopkins University School of Medicine, Baltimore, Maryland, United States of America, Department of Health Policy and Management, Johns Hopkins Bloomberg School of Public Health, Baltimore, Maryland, United States of America surveyed 2,106 physicians about over treatment. The survey found that according to physicians themselves, 20% of all medical care provided to patients are unnecessary. Physicians indicated that they felt 25% of tests, 22% of prescription medications and 11% of procedures were not needed. 85% of doctors said they were over treating for fear of medical malpractice and 59% because they were pressured by their patients. However 70.8% of them recognize that when they over treat patients, physicians tend to perform unnecessary procedures that are the most profitable to them. Over treatment can cause additional and unnecessary harm to patients and obviously unnecessary financial burden to patients and to insurance companies. Spine surgery, operations done to narrow blood vessels in the leg or stent procedures are all profitable procedures that are the most often found unnecessary for the patient.